Currently writing/recording with my band Zhoda. Studying Classical Guitar Performance at SHSU. Hello, my name is Taylor! 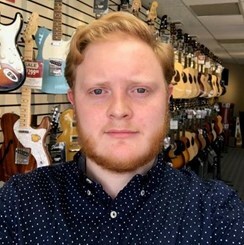 I am currently studying Classical Music Performance at Sam Houston State University in Huntsville, TX and have been playing guitar for the last eight years. While having an expertise in guitars and the respected gear and accessories, I am also very farmiliar with home studio equipment and can give you advice and suggestions for recording interfaces, studio monitors and headphones, recording programs such as DAWs and plugins, and other hardware such as microphones and MIDI controllers! Let me help you with all of your guitar and home studio needs!